It's the last day of September which means we are going into the heart of the fall season. Although the temperatures over here have been feeling more summer-like rather than fall-like I'm still styling fall pieces for you guys. I partnered up with Modcloth once again to share some of their amazing fall pieces. I'm head over heels with this A-line corduroy jumper! The mustard hue sold me instantly because it reminds me of fall so much. I paired it with a basic black turtleneck and these amazing floral booties from Modcloth as well. Velvet is such a huge trend and I don't see it dying down no time soon. They are sock-style booties with a chunky block heel. They are super comfortable and pretty much pair well with anything. You'll see these on the blog pretty soon again! If you have never shopped Modcloth, know that they have an amazing variety of items and their sizes range from xxs- 4xl. EverBODY can have amazing style and I love that they believe in that. I love being apart of the #ModClothSquad. They also have an app and it recommends items based on your size. My jumper and top were both a size medium and they fit pretty comfortable. Happy fall! Hope you guys enjoyed this post with Modcloth! This post is sponsored by Modcloth. As always all opinions are my own. Thank you for supporting the brands that work with Patty's Kloset. 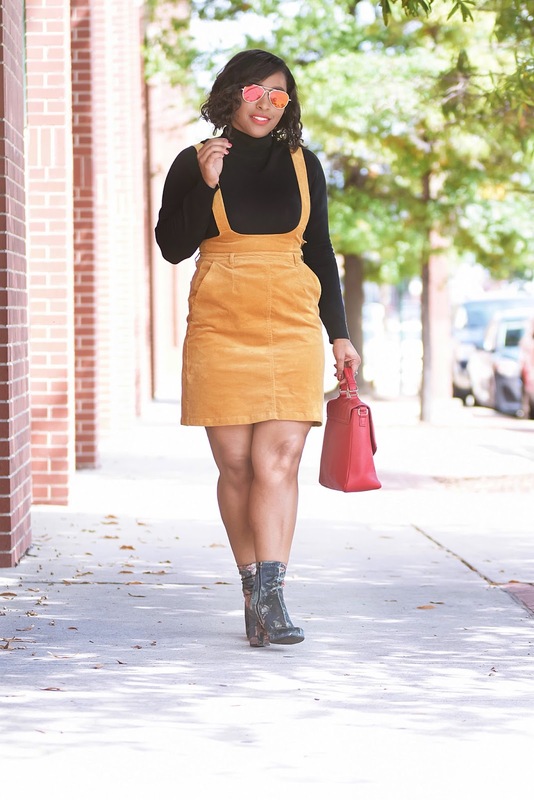 This marigold jumper is absolutely adorable on you! So cute how you mixed all the colors! Thank you! It's my second time and they have amazing stuff. Thank you! My new favs. That jumper looks so good on you! This outfit was made for you! SO cute! ModCloth has the cutest clothes! The yellow piece is soooooo cute for fall!